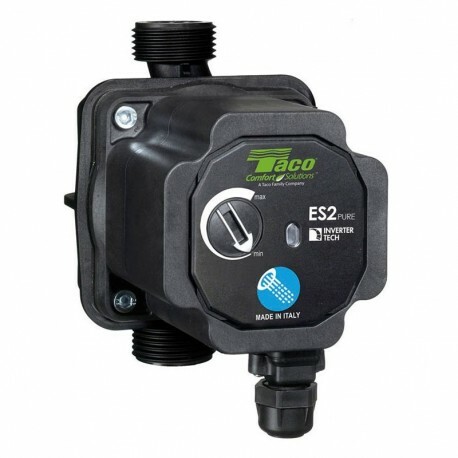 Taco E-PURE is a wet rotor high efficiency circulator, driven by a permanent magnets synchronous motor (PM motor) controlled by an on board inverter. The motor is protected against overload thanks to a thermal protection and an automatic electronic release function of the rotor. No external protection is required. Operated by selector technology. LED user interface. Domestic hot water circulation, drinking water circulation systems and similar domestic and industrial circulation systems. The products meet the requirements of the laws, laying down rules concerning technical equipment for the treatment of domestic hot water. Installation, maintenance or repair of the circulators must be performed by authorized persons and is not allowed the use of accessories and spare parts that are not original. Inappropriate and/or different uses from those indicated in the instructions manual are not allowed, if not previously agreed in writing by Askoll.